My CE Weaver arrived early doors this morning. It is absolutely superb! The workmanship is of the highest standard. The hand carved mahognay neck is beautiful. The inlays are just right - just as Alfred liked them. The 12" wood hoop gives the 'jo power and tone. This is going to be a hard one to put down ....and it's 3 hours to home time. 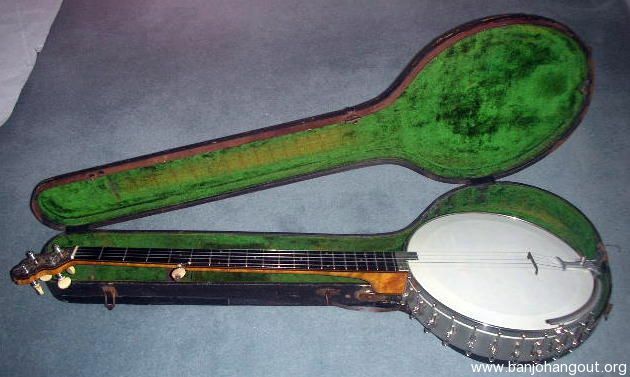 My first banjo was a Gatcomb. I got it for $2 when I was 12 years old. It was fretless but it had inlaid markers which from a distance looked like white frets. If I placed the bridge so that the 12th inlaid "fret" was half the vibrating length of the string the bridge was so far back it was nearly touching the tailpiece. I liked it like that and that's where I kept the bridge until the banjo was stolen in 1975. That is a very good observation and hypothesis about the E tuning and bridge placement! I'm really glad you mentioned this and have tested this on your Luscomb. I have 4 Luscombs and 4 Gatcombs here now, only one is playable. Varied pot sizes/scale lengths. I'll have to get them out and plot the bridge locations. I do have a feeling Luscomb and Gatcomb were closely associated from various observations over the years, and so now in this discussion and your E tuning observation, more interesting to me to go back and examine these and think about this. I don't have much to add on the scientific end, but I do feel that there is room for "classic banjo" to be played on any kind of banjo. Some will be more user friendly than others. While I love that crystal cracking tone found on recordings made into the 1960s, I also understand that it does not translate to a modem (i.e. current) audience. It can make some people physically wince (I have seen this). Music tastes have changed. I have no problem with different voiced banjos intended or otherwise. My main player has become a Gariepy Van Eps model banjo. While it was supposedly made under the direction of Robert Van Eps, it deviates in proportion from the FVE built banjos in a couple major ways. The rim is nearly identical and is well within the variations I have seen on FVE built banjos. The neck profile is also the same as FVE banjos. The wood is obviously from the same stock of lumber FVE used. The major difference is that the scale has been reduced from 28.5" to 27" with a 22 fret neck proud of the rim. The bridge is more centrally located. I will try and post photos with measurements in comparison to my FVE built banjo this weekend. This is the best sounding banjo I have ever played. My wife (the only one who has heard it live so far) has endured a side by side comparison with my FVE, me playing one then the other-- back and forth. According to her the GFVE is louder, fuller and pushes more power than the FVE. They are both wearing new top frosted heads set to the same tension. Both have the same size strings. The moved bridge takes out some of the extreme brightness that FVE banjos are known for. Even FVE himself was playing far from the bridge in later years to bring a fuller tone. The GFVE also takes a taller bridge that I have slanted for a high bass action and low 1st string. AFA filling a concert hall-- It does not matter how loud the banjo is, it will have a microphone put on it these days. I do not know what Gariepy's intention was on resizing the FVE, it could have been pure chance. But I like the results. With that said... I am not defending the centrally placed bridge that has come to define modern banjo design. In my small experiences with them it makes for a slow to respond banjo and feels like I am playing in mud. I also love clad rims. And speaking of clad rims, Chris, having discussed with metal workers I have concluded that the period term "spun" is misleading; "Formed" would be better. The forming of metal hoop over the wood rim with wires on each end would happen at a fairly slow RPM. I have heard of people trying to form the metal on a lathe and that is WAY too fast. The SSS woodcut showing a cigar smoking man spinning a rim gives the impression that it is spinning at a high speed. I think that is an action drawing and that the actual RPM was much slower than the drawing implies. There are "vintage" videos on youtube showing sheet metal workers in factories (from the 40s-60s?) and some of the clips show metal forming that is very similar to how a rim would have been "spun." Oh, "stuffing"-- FVE, Bill Bowen, Alex Magee-- all those guys took to using a "sound bar" in their banjos. Some used a paint stirrer stick while others were made from balsa wood. My GVE came with a bunch of these made from different hardness' of pine and balsa. It takes the echo out. The wine cork was also a popular addition as a "sound post" placed near the neck between the dowel and the head. I suppose both of those could be considered "stuffing." Below is the "sound post" in FVE's "Meal Ticket." Even though it has drifted considerably off-topic, this has been an interesting, if sometimes intense, discussion. 1. The Ossman and Glynn engagement referred to above, was at the Madison Square Roof Garden, an outdoor venue located on the roof, and not within the main hall. In the 1890's, outdoor roof garden variety shows were popular during New York's hot summer months. The Casino Roof Garden and the American Roof Garden were two similar venues at the time. In 1893, Ossman and Glynn were two newcomers to the MSRG's evening roster of vaudeville entertainers, eventually earning $70 a week. Their then better known compatriots, Brooks and Denton, also working the roof garden circuit, were earning $85 a week. In his 1906 letter to Fred Bacon, Vess Ossman writes : " make me another banjo, 12 inch rim, 19 1/2 fingerboard", knowing that for a 12 in rim, and 28" scale, the standard length neck (19 1/2 in) accommodates 20 frets, and places the bridge at a little less than the third point of the rim diameter. The longer neck length required to accommodate a 22 fret fingerboard with 28 in scale, would result in bridge placement closer to the centre of the rim. 10 3/4 x 26 : the bridge sits closer to the centre of the rim than the third point. 11 13/16 x 28 : the bridge is further distant from the centre of the rim than the third point. To achieve what was then considered optimal tone, the makers realized that smaller rim/shorter scale banjos got a favorable tonal boost with the bridge placed a bit more than the third point toward the centre of the rim, while for the professional, larger rim/longer scale banjos, the optimal bridge position was further distant from the centre than the third point of the rim, presumably to deliver a crisper, less boomy sound and/or dampen unwanted overtones. Jody-I agree with everything you said here, and just about everything else I've heard you say. I was not trying to criticize Eric nor catch you in contradictions. Part of my citing previous quotes was also for clarification for me. Of course you can change your mind. Of course we can only be ourselves. I very much appreciate your report on your Eric Tubaphone and it's live performance...at some point I was going to ask for just that information from you. Joel and Jody....of course there is room for other banjo designs in classic banjo and that many non classic intended banjos can be adapted....I did say I am not against experimentation....I engage in it frequently to further my work and my abilities. Most of my comments that seem "Nazi-ish" are delivered from the standpoint of historical design, the pardigm of which I explained has been thoroughly road tested during classic banjo's heyday, which is my point....and is pretty much any good luthier's point....there is a reason the original time proven designs became the standard, and that information should not be discarded willy nilly, it should be paid attention to with respect. I look at classic banjo as a classical form...it is written, read, and passed down to others from a score at it's core just like classical music. FOLK music by definition is passed on by rote or word of mouth and is not written down. It may later be preserved and passed down in written form, but in it's truest sense, it is not a classical written dissemination. Jody can speak to this much more than I and Joel and Jody have posted about this numerous times in the past. What Joel said here a few posts ago to the effect of classic banjo being a past art form that .....I can't remember the right words...but it's past style that to live has to be preserved. In this, the instruments are key to understanding most of it. I have been fortunate enough to collect quite a few original recordings and be able to play them back as accurately as anyone could 140 years later. I have good ears and that's been tested and proven many times in my work. I think I have a pretty good idea of how the original banjos sounded originally, which is one reason I am against noise reduction and doctoring of the original recordings because the noise is in the same frequencies as the music, so any altering of the original sounds ...well...the FIRST thing to go is the actual tone of the banjo. I do think live and on recordings, the original players had their heads tigther than they should have been for optimum tone in order to gain cutting power. I also think there was a lot of tuning up a fret or 3 for recording. My point is that I believe it's important to understand the original makers' and players' intents for their instruments, if for nothing else, understanding of the music. I am not against microphones, I am not against making a new classic banjo in a different way than the old ones, and I am not a preservationist of music to the point that it has no room for individual interpretation or new compositions. Rob M and I have talked about this a little bit, and Jody dealt with it very very well in his next to last post. I agree whole heartedly with all of this. I just think that this whole bridge voicing thing should be something all classic banjoists are aware of....it's relatively 2 groups as an oversimplification.....3 octave necks on smaller pots or less frets and longer scale on big pots....I used to wonder "why can't I have a big pot sound and 22 frets???? "....years of lutherie, listening, paying attention, and collecting old banjos and I finally understood. I think every classic banjoist should understand these concepts.....so that you KNOW what you are buying and playing...what is the "gold standard" and what is not...at least in the original context of the original music.....after all, I think that is why we are all here in the first place. Information can't hurt you. Neither can art. Conversely, I believe it is every classic banjo maker or luthier's responsibility to understand this relatively fully. What I AM a "Nazi" about is confusing or portraying something as historically or genre-wise correct WHEN IT IS NOT. I THINK everyone here that has been posting recently agrees with me. So my intent in all of this is for clarity and awareness....not judgement....unless as I suspect, the new CE folks don't know what they are doing regarding classic banjo design and marketing. THAT needs to be either corrected on their workbenches and/or their marketing....but they would FIRST need to understand how to build what they are building, and market it appropriately. Owning the CE name implies and brings with it some responsibility, especially if invoking a name like Weaver, whose banjos were COMPLETELY different than the new one. I do think there is some ignorance or irresponsibility or some combination of both in this situation as I perceive it. Shawn-Thanks for that. I used to own and still have a photocopy of the original Ossman/Glynn Madison Square Garden program. The engagement continues to hold the record for either the longest MSG engagement in history, or the the one that was held over due to continued demand/sellout the longest, I forget. Your #3 is completely correct in all regards. Your #2-I THINK Vess's SSS T'bred was the same ....12x28 with 20 frets....? You and/or Joel can confirm this. Joel- A Paint Stick or Grover "Simplex" or whatever it was called add on raised head tonering are things I do not consider stuffing....just like a violin soundpost is not stuffing....though a violin's soundpost is integral to the violin's design and function, and a paint stick to a banjo is not. I was making a point about setting up an 1890's concert gut string banjo to play "Little Rabbit, Where's Your Mammy?" and "Spotted Pony" on with steel strings is, in it's entirety, a stupid thing to do and of course puts banjos not made for that purpose into a state where they sound so bad that then need some sort of non original Jerry Rig to "make them acceptable" so we can all pretend hillbilies in 1892 played fancy engraved Fairbanks Electrics like all the current dealers who alter them for that purpose and absolutely defend doing it "since they've been doing it 'safely' for 40 years". I THINK you know who in particular, and in general, I'm talking about. Ask George Gruhn about permanantly altering a vintage instrument....I've had LONG discussions about this with him over the years. ....to everyone's relief, I'm sure, the latter paragraph will be saved for some other discussion some other time as I've taken over and de-railed this thread in a way I did not imagine would happen in my first post. For this my apologies, but I am happy this stimulated some thought on this subject as I think it needs to be common knowledge for classic banjoists. Please forgive the crude illustration, it was done very quickly. Below are the measurements (done with a tape measure so not exact but close enough for the discussion). The GVE on the left has more body and full range of tone. It sort of surrounds one. While the FVE is sharp and thin like a fully auto BB gun. I love the tone of both, but I shamefully admit that I favor the GVE and it's fullness. I will try to record something with them both. And Chris, we are on the same page-- if there is a presentation of accuracy, and it is not true to the source, then it is False. That is misleading and irresponsible. Take the bridges I make for example. I decided to replicate actual historical samples. I notch them with the historically correct slanted or angled notches (which is a brilliant design as the strings cannot be pulled from the notches no matter how hard they are played). No one else does that. My "Morley" bridge is correctly sized to the originals I measured (with the correct extra 4th string spacing). The SSS pattern is extremely narrow compared to the modern idea of spacing, and that small spacing is all I use now. What is funny is that I expected the SSS pattern to be the least popular due to the small size. It is the one that has sold the most! I am enjoying your critical thinking on banjo voices Chris. No reason to stop the dialog. Joel-Thank you for this and all of your comments. We haven't talked since that Thanksgiving phone call a few years ago, but you are dear to my heart. I think we think the same on a concept that I feel very strongly about, which is preserving the truth of the history of the development of the five string banjo in general, and more specifically, the classic banjo vignette as it unfolded in the real world....along with the industrial revolution, which I am also passionate about....for reasons that are obvious to anyone that knows any history and also pays attention to current events worldwide the last few decades. The industrial revolution, classic banjo, and the dates for both are a very very close intersection (as were the development/infant popularity of bicycles and aviation). I was self conscious about my comments here, which were all genuinely meant for edification from a standpoint of my experience that I think is not quite common here, being a banjo specific luthier. I absolutely did not mean to hurt David Ward's feelings or sensibilities, and I have been feeling guilty about this for a few days since this part of the conversation started. You have nothing to feel odd about comparing your preferences of the GVE and the "real" VE. The 1" shorter scale means less string tension, and that affects quite a lot of....well lots of things...string "feel" and speed of response after the picked impact of the note, down pressure on the bridge and therefore soundboard/head, and other things. Fred was a big tall guy...maybe you are not? He designed everything from the Meal Ticket forward to do what a meal ticket should (hence the nickname for that banjo)...which was earn a living by extreme performance acoustically in live gigs and acoustic recording situations. Gareipy was obviously from a different time that represented the generation gap of playing comfort or ....ha...."normal" size people and microphones and amplifiers. From a pure physics based lutherie standpoint as well as a banjo player, I can fully see the mechanics of why you describe your preference. Hey, in the big picture, no biggie. 27" scale is a respectable banjo scale length no matter what style of 5 string or plectrum you play...and is still not the easiest stretch for some of us in the first position sometimes. Also, again (I wasn't going to go there on this thread but here we go since you started it....LOL), your VE banjos are raised heads....so the active soundboard means the reference point diametrically on the head is not the full head diameter....this is what I hinted about that I wouldn't get into now in my last post). The point is to get to the art/music. The way folks did when this was popular music consumed by the masses sure is a damn good start if not the "bible". On bridges, I appreciate all of the research and work you have done there. I have to confess and tell you now before I post my upcoming banjo project thread (that this subject is part of), that you have helped me immensely in this. The banjo I just built out of 1930's parts that is basically an "original" Electric with parts from different companies but has specs like a 30's CE.....when I was setting the neck and setting it up, nylguts sounded horrible, and I've always struggled with my right hand on classic banjo....because....I was just thinning down bluegrass spaced bridges....which actually sonically worked incredibly well.....but my right hand never felt right. Keep in mind I've been a bluegrass banjo player, and not a mediocre one, since I was.....well for over 40 years. Horn players call their mouth "posture" the "embrochure". I borrowed that to describe the right hand of 3 finger five string banjo right hand posture. Long story longer, when I got this banjo to the point of acceptance, it was LaBella 17's and the correct bridge as you describe. Not only did the banjo open up, but my right hand felt....SO NATURAL. In looking at bridges for classic banjo my thought was "how in the hell can anyone play with a string spacing that NARROW'....then I read a post you made on "that other banjo forum" about right hand spacing, speed, and comfort as related to the old, real, Stewart style bridges. The classic banjo right hand embrochure means....flesh fingertips with no pick "extensions"....this changes everything, including the movement of the fingers and the clearance needed during their movement (which is obviously much less without picks on and your hand being lower since there are no pick "extensions" sticking out of your fingertips). You being outspoken about accurate bridges is not just history....like my points on this thread, it comes down to physics and things that can be measured and quantified regarding a right hand with/without picks and the space needed to accomplish the goal. KEEP DOING WHAT YOU ARE DOING WITH BRIDGES. I suppose we can see now this thread could go on forever...but I'm feeling really guilty about my involvement in a thread that I de-railed (genuinely without meaning to). Joel, your pictures and measurements attachments did not appear for me....they are not visible. All I can see is the fellow on the spinning lathe....but I do understand what you were conveying just from your words. Again, most of my right hand concerns evaporated with the right....1.5" (I think it is)...spaced bridge just recently (I'm a stupid old bluegrass guy at heart after all). Slotting them the real way is obviously logical. Wow...good pics...they just showed up for me, Joel.....I got it...that was thorough of you......thanks! I have quite a lot of experience with Gibson and other raised head steel strung bluegrass banjos and their sonic comparison during/after work to flatheads of the same ilk, but not near as much in classic banjo...there aren't that many raised head classic banjos....I've only had an Orpheum #3 in my possession for a few months a few years ago, and only played one VE, and worked on neither. My gut reaction is the bridge movement is more than I expected it to be for the scale change (didn't realize the VE was 28.5 instead of 28 at first) given the raised head thing. Again, I'm a bit reluctant to give any insights since my raised head gut string banjo experience is basically nill....for now. But if it works, it works. Obviously Gariepy was in the loop with Fred. What they discussed and why the changes, who knows, but the GVE is still an "original" classic banjo for the most part, and if it works, it works. 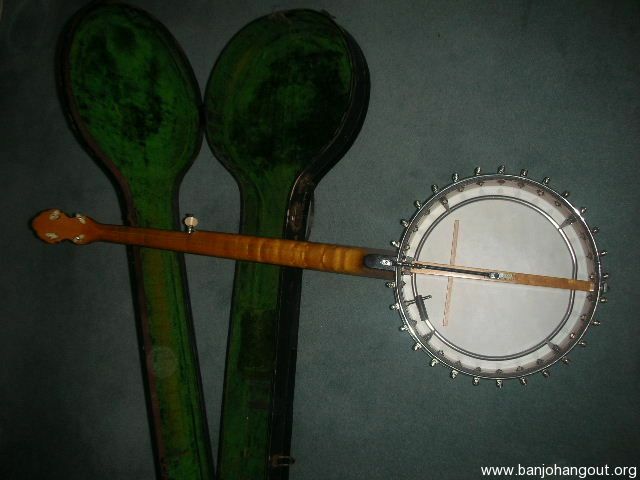 ...the air chamber of the pot itself is larger than the vibrating soundboard, which is not true of 99% of the other banjos...the "flatheads". That concept is something I only have experience with with 11" bluegrass steel string banjos, so I'm not really qualified to at this point to have any concrete wisdom for myself or anyone else. Regardless, that recording of you playing the GVE on the other thread...if it sounds that good, stop feeling guilty and just play it! Just one quick comment in connection with narrow bridges. In my complete Baur's Budget recording, the only bridge I had for my five-string Temlett was a seven-string, which really brought the strings close together. After half an hour I never noticed it. Just a note about metal working in general. Every piece of equipment and every different material interact differently. Generally, we discuss the interaction of tool and part surface with relation to "surface speed", especially when the part is moving and the tool is not. Metal spinners have tables of speeds and feeds just like lathe and mill operators do, these tables were developed empirically in Stewarts time (now backed up by the math). In any case, the typical formula is getting the right surface speed. As such, to get the same surface speed, large diameters use slower rpm vs small diameters. Very simple math there...even I can do it (with a calculator). Safety was not much of a concern in the Stewart shop, obviously! I notice that the rim that is chucked up in the spinning lathe has a strap around it to hold it in place. This strap holds the rim to the form. The rim at this point is not brazed together, it is still a strip of metal. The operator will form one edge with a spinning tool called a spoon (and some wax to reduce friction). The form probably allows him to roll 1/2 of the bead needed for the wire. He'll then take it off and turn it around, strapping it back in place, etc. Then he'll form the other rim edge. The cool thing is that the rim goes into the lathe as a flat strip. It is not necessary to roll form it previously, the beading operation will cause the rim to conform to the geometry of the form, circle and all. You would need a form for every common rim diameter. Easy to make, probably maple. There are a number of metal spinning videos out on the web, large aluminum cooking pots are commonly spun.